SAN FRANCISCO — In Yemen, 18 million civilians are now at the brink of starvation, including 5 million children. The situation in the country, widely considered to be the world’s worst humanitarian crisis, is entirely man-made – the sordid result of the Saudi Arabia/UAE coalition’s war to control the Middle East’s poorest nation, a war that deliberately targets civilian infrastructure and the civilian food and water supply. Despite the fact that these are clear war crimes, and despite the mass suffering it has inflicted on Yemen’s innocents, this effort continues to receive U.S. and U.K. support. In the face of the enormity of this completely preventable crisis, some international activists have taken matters into their own hands, giving it their all in order to bring much-needed attention to the plight of the Yemeni people by sacrificing their own quality of life in a stunning and inspiring show of solidarity. 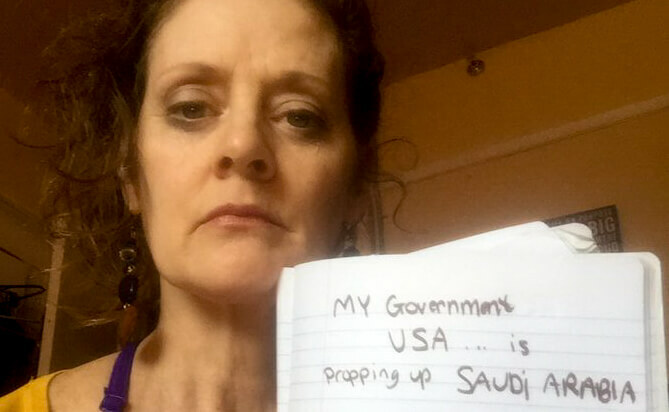 Pamela Bennett, an American woman living in San Francisco, has been on a hunger strike since October 8 in an effort to show solidarity with Yemenis facing famine and to raise awareness in the United States in particular about upcoming congressional efforts to reduce or end the U.S.’ role in the genocide currently occurring in Yemen. Bennett is not alone in her efforts, as a contact from her Facebook page, “Yemen Rising,” is also currently in the seventh day of his hunger strike. Bennett, however, is on her 23rd day. Others had initially joined the hunger strike but had to end, some leaving for personal reasons while others were forced to stop after being hospitalized as a consequence of their participation. After some of the original hunger strikers had been hospitalized, Bennett began drinking juices and broth in addition to water in order to prevent major health complications. As part of her bid to raise awareness about Yemen through the hunger strike, Bennett posts daily videos to Facebook discussing her experiences as a result of the hunger strike and her reasons for taking such a drastic step to raise awareness about the crisis in Yemen. At this moment in her hunger strike – now in its fourth week – Bennett stated that her immediate goal in continuing the strike was to raise awareness about current legislation in the U.S. Congress related to either reducing or ending the U.S.’ participation in the Yemen conflict, either by ending arms sales to the coalition or by ending the U.S. military’s role in the fighting and the coalition’s bombing campaign. In particular, Bennett is calling on U.S. citizens to contact their representatives, urging them to support Senator Bernie Sanders’ (I-VT) JR 54 that would end the U.S.’ role in Yemen as well as Rep. Ro Khanna’s (D-CA) HR 138that also calls for a U.S. withdrawal from Yemen. Another House bill, Rep. Jim McGovern’s (D-MA) JR 102, would restrict arms sales to the Saudi government. Any person interested in participating in the hunger strike alongside Bennett is urged to contact her either through her page “Yemen Rising” or her personal Facebook page. Bennett stated that water-only fasts are no longer encouraged and that all potential hunger strikers need to be in good health before beginning. She emphasized that the hunger strike is “a media campaign to combat media silence, [so please make] videos about what you are doing and why these actions are needed to spread the word.” She also noted that some people have done shorter-term solidarity fasts, anywhere from one day to one week, in order raise awareness. Will Khashoggi Incident Be Saudi Crown Prince’s Undoing? Saudi journalist Jamal Khashoggi’s disappearance since October 2 after entering Saudi Arabia’s Istanbul consulate clearly suggests foul play. His likely abduction and possible murder by Riyadh created an international uproar. Make no mistake. Saudi relations with the US and other Western countries are strong – given its huge oil reserves and support given Washington’s regional imperial agenda. How crown prince Mohammad bin Salman (MBS) fares if Khashoggi’s abduction and/or murder is proved is another issue entirely. His status and ascension to the kingdom’s throne could be doomed. Saudi king Salman may replace him as crown prince to soothe international anger, especially in the region and West. On Monday, Turkish President Erdogan demanded Riyadh prove Khashoggi left the Saudi consulate in Istanbul as claimed. Turkish officials believe Khashoggi was abducted and killed because of his outspoken criticism of the kingdom. Turkish media reported that a number of diplomatic vehicles left the consulate on October 2, the day Khashoggi disappeared. Turkish investigators believe he may have been killed, his body dismembered, taken from the consulate in boxes, and flown to the kingdom for disposal. The so-called anonymous Saudi Julian Assange whistleblower known as Mujtahid uses Twitter as a platform for his remarks. He believes evidence Turkish investigators uncover may dissuade the Trump regime to stop supporting MBS – suggesting Ankara already has enough evidence to prove his responsibility for Khashoggi’s disappearance and likely death, adding they’re waiting to complete their investigation before passing judgment publicly. “We called a few other places. These are lower officials, but they said: ‘We have evidence he was killed in a barbaric way. We will announce it’ ” later this week. Last May, exiled Saudi prince Prince Khaled bin Farhan Al Saud since 2013 said the kingdom could “descend into chaos,” destabilizing the region and elsewhere. “(I)f Saudi Arabia descends into a state of chaos, there will be global chaos, and (the kingdom) will be a source of terrorism for the entire world as it will support and sustain international terrorism” – what it’s done for many years, he failed to explain. So far this year, IFJ reported 73 journalists killed worldwide. No fatalities from their ranks in recent memory caused the international uproar like Khashoggi’s disappearance and likely murder. Filed under: MBS, Saudia, Stephen Lendman, Turkey, US-Saudi Relations, USA, Wahabism At Work | Tagged: MBS-Khashoggi |	Comments Off on Will Khashoggi Incident Be Saudi Crown Prince’s Undoing? On October 2, prominent Saudi journalist/critic Khashoggi disappeared after entering the kingdom’s Instanbul, Turkey consulate, needing documents for his upcoming wedding, scheduled for this week. Instabul’s chief prosecutor initiated an investigation into what happened, including an examination of all video surveillance footage of consulate entrances, along with checking all inbound and outbound flights since Khashoggi’s disappearance. Crown prince Mohammed bin Salman (MBS) is ruthlessly intolerant of regime criticism. If it’s proved responsible for Khashoggi’s death, relations with Turkey will likely worsen. Filed under: Saudia, Stephen Lendman, Turkey, US-Saudi Relations, USA, Wahabism At Work | Tagged: Khashoggi, Saudi Oppression |	Comments Off on Did the Saudis Kidnap and Murder Journalist Jamal Khashoggi?